Chris and I got into a fight this week. It happens. I think mainly is was induced by the fact that all of last week and early this week I have been averaging about three hours of broken up sleep. Not a good average and after so many days your mind sort of wanders into this hazy insane state and all hours of the day feel like 2am. You know that irrational time of day - at least for me - let's just say I might have picked the fight a teeny tiny bit. Like I said, it happens and we kissed and made up. But along with the sleep deprivation I wasn't sure how to pull off a big fancy date. Luckily it was simply dessert this week. I told Mr. Gough we were suppose to have a dessert date and even though I was tired and not entirely in the mood would he be willing to join me for a few hours of conversation over something sweet. I chose a cherry chocolate chip soy ice cream cone with vegan oreos on top! It was super yummy. Chris picked simple popcorn for his dessert and we sat together in our family room with the doors open wide letting the cool summer air in for a change. We are finally getting some nice weather around here! We talked about his new job. Something I have yet to really dive into in this space but let me tell you his new job is such a direct gift from God it blows my mind. The Lord made way for Chris to start a job at Seattle's Union Gospel Mission in April - a brand new position basically working as an ambassador for UGM to Churches all over king county networking and joining the hands of so many amazing programs. He is basically responsible for getting Churches involved in community outreach and it's been so fun to see how God is using him already! He told me about a brown bag he attended and all of the exciting things going on locally, serving the poor and homeless. It really is incredible to sit and listen to him pour out his heart and all that God is showing him! We also joked around - he can sure get me laughing and although I wanted to fall asleep after my cone was finished I enjoyed our little dessert date so much! No fancy decorations or candles this time but a good dose of intentionality was just what the doctor ordered. And then Chris ordered me to go downstairs and sleep in our guest room so that I could finally get some sleep! Andi and I have been doing these little date nights for six months and it still never ceases to amaze me how important this time focusing on our marriage is and how much it helps being on the same page with one another, listening and encouraging and laughing together without the distraction of everything that gets in the way so often! I have received SO many amazing emails not to mention comments about dinner at eight. Andi and I hear you we want you guys to be able to get involved and are currently working on the details so stay tuned if this is something you want to be apart of. We are thinking July - I hope you will considered it friends, taking part in the call to be intentional about our relationships even when life gets so busy that sleep is all you think about. I am speaking from experience a date night in will bless your home! oh and you can read a little bit about Mr. Goughs new job HERE he hasn't written a ton just yet but he plans too and I can already tell it's going to be good! I have so enjoyed this series (tho this is my first comment I think) :) Such an important thing to do w/ the hubby - but so hard to be intentional about. Great job. Awwww! I love some a simple ice cream and popcorn brought you guys together. Well... kinda. But I love how your dinner went [: Specially on a hot summer night... A ice cream be so awesome. Specially if it was "healthy"! Hope things lighten up and you get some sleep soon. A sweet little date is a good start. now was it a gluten free cone? ;) looking forward to the challenge in July! We had our 2nd go around of our own dinner at eight. We are loving being intentional, even though it has not been really peaceful & private yet. Ha! Something that stands out here in your post - Mr Gough shared his heart. How often to married people forget to share their dreams & passions with each other? Way too often, I think. I know I can be guilty. Oh man. 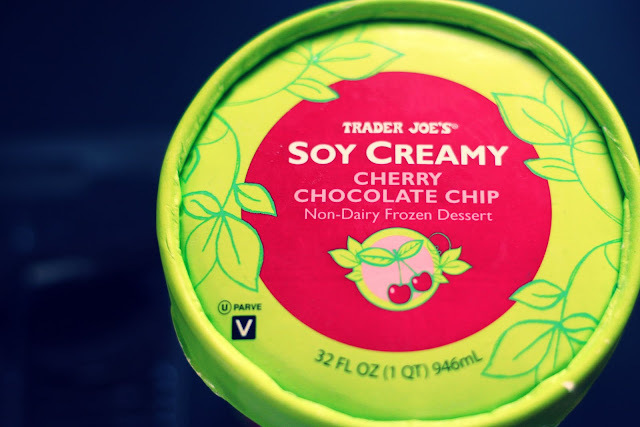 I love that TJ soy ice cream. I can eat WAY too much of it. 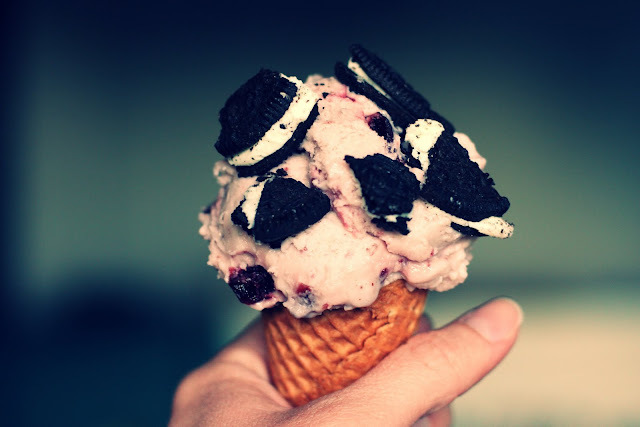 Love the photos of the cones...I'll have to try the vegan oreos on top! But most of all I am glad you got a night of good conversation and sleep! Love you! You.Are.Going.To.Make.It. :) See you this weekend! 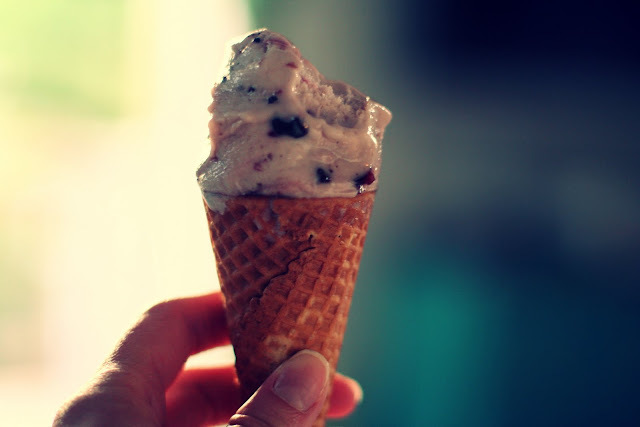 Mmmm... perfect time of year for ice cream! Love it. And I can't wait to find out what you two are cooking up for your readers! I'm just loving these dinner at eight posts and would love to join anything that you organize! Tonight we lit a candle as we ate our takeout pizza (while Isla sang "Happy Birthday" as she always does when there are candles...) and it made me think of you and how I need to be more intentional about planning special dates at home, particularly given the crazy phase of life we are in right now. Keep us posted! after reading your posts this year and being so inspired by your intentionality we finally attempted our own "dinner at 8" this week! it was so fun to prepare and be intentional in our own home. thank you so much for the encouragement to do this! I loved this date...so real! I am thinking I would love to join in anything you do. You blog is simply gorgeous! Sleep will definitely do that!! Vegan Oreos?!! Now this I have to try!